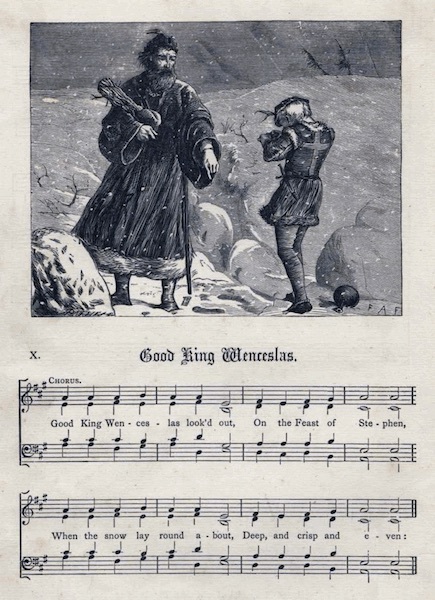 One of my earliest recollections of Christmas is the carol “Good King Wenceslas”. There’s also an image that comes to mind from a school music book of a drawing of the said king looking out from his castle towards a pauper struggling through the snow ‘deep and crisp and even’. Describing snow as ‘deep and crisp and even’ seems to have made a lasting impression on my young mind which had only experienced the heat of an Australian Christmas until that time. The rest of the carol’s lyrics have always been a bit of a mystery to me. This year, in a fit of (another) pique at the commercialisation of Christmas I thought I’d scrap all those carols extolling the virtues of Santa and Rudolf, and settle for a more traditional tune. “Good King Wenceslas” sprang into view, with its mysteries still waiting to be discovered after a lifetime buried under the deep and crisp and even snow. Wikipedia came to my rescue:’”Good King Wenceslas” is a popular Christmas carol that tells a story of a Bohemian king going on a journey and braving harsh winter weather to give alms to a poor peasant on the Feast of Stephen (December 26, the day after Christmas). During the journey, his page is about to give up the struggle against the cold weather, but is enabled to continue by following the king’s footprints, step for step, through the deep snow. The legend is based on the life of the historical Saint Wenceslaus I, Duke of Bohemia or Svatý Václav in Czech (907–935). The name Wenceslas is a Latinised version of the modern Czech language “Václav”. So the carol is more about December 26th (Boxing Day) than Christmas Day where we are urged to give to the poor rather than receive gifts ourselves. Could John Mason Neale, the hymnwriter, have been fed up with the commercialisation of Christmas even in 1853? Happy Christmas (and Boxing Day) everyone!